Gideon Gono: Notes for "convenience of the banking public and corporate sector"
HARARE, Zimbabwe (CNN) -- Zimbabwe's troubled central bank introduced $100 billion banknotes Saturday in a desperate bid to ease the recurrent cash shortages plaguing the inflation-ravaged economy. 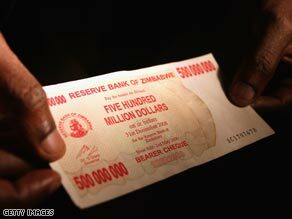 A shopper displays a $500 million Zimbabwean bank note. The bills officially come into circulation Monday, although they were on the foreign currency dealers market Saturday. As high as they are, though, the bills still aren't enough to buy a loaf of bread. They can buy only four oranges. The new note is equal to just one U.S. dollar. Once-prosperous Zimbabwe has seen an unprecedented economic meltdown since it gained independence in 1980, with the official inflation rate now at 2.2 million percent. Gideon Gono, governor of the Reserve Bank of Zimbabwe, said the new notes are for "the convenience of the banking public and corporate sector" in light of price hikes. "The RBZ has noted with concern the unjustifiable and incessant general increases in prices of goods and services. It is therefore appealing to the business community to follow ethical business practices as well as take an interest in the plight of the general public," Gono said in a statement dated Friday. Zimbabwe started issuing large bank notes in December, starting with denominations of $250,000. In January, the government issued bills in denominations of $1 million, $5 million, and $10 million -- and in May, it issued bills from $25 million and $50 million up to $25 billion and $50 billion. The new bills are actually bearer checks and have an expiration date of December 31. Zimbabwe has not had formal currency since the introduction of bearer checks as a temporary measure in 2003. "The RBZ is fighting a losing battle," economist John Robertson said in Harare. "As long as the inflation remains high, cash shortages will persist. There is need to address the inflation by increasing production so that too goods do not [cost] a lot of money."